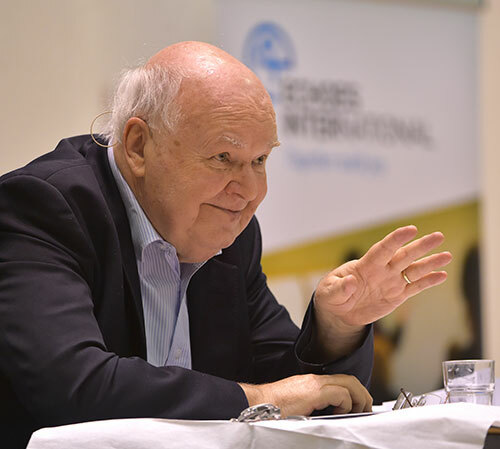 On Friday 9 March, Glasgow, John Lennox, Professor of Mathematics at Oxford University and internationally renowned speaker on the interface between science, philosophy and religion, spoke on the subject Are God and Faith Anti-Science and Anti-Reason? This topic hit a nerve, as the joint event between Glasgow University Christian Union (GUCU) and Echoes International, a mission organisation, saw all 500 tickets go within a week, with a large waiting list of more people keen to come along. A full house at the Tron Church, Kelvingrove, in Glasgow’s West End near Glasgow University, heard John Lennox explore questions relating to science, philosophy and religion. John Lennox suggests: “I think that young people are beginning to get tired of strident aggressive atheism. They are also increasingly preoccupied by the search for a fulfilled life and find no credible solution in the moral relativism that they meet everywhere. Due to such high demand for tickets, the event was also live-streamed and recorded, drawing in an audience from around the world at www.echoesinternational.org.uk/johnlennox, and audiences in the hall and online were able to text and tweet questions for the Q&A session afterwards.